After my vacation was ruined by a cold I was at least happy, that one day after my return the postman ringed to deliver my figures of Seena Kanon from Max Factory and Momohime from Alter. The Customs intercepted my parcels so I had to pay 22€ customs fee additional. Seena Kanon is a character from the popular game called Shining Wind. I haven’t played Shining Wind nor have I watched the anime adaption, but I really like the character design of Toni Taka. This figure of Seena Kanon was manufactured by Max Factory she is a scaled 1/7 figure which makes her 235mm in height, to me who mainly owns 1/8 scaled figures she appears quite huge. Max Factory released her July 20107 and also announced bikini versions of Kureha, Xecty and Clalaclan, for once I’m not planning to buy another figure of this Shining Wind bikini series. In general I’m no fan of short haired figures, in case of Seena Im loving it, her hairstyle, the radiant color as well as the freely sculpted strands which look really pretty. One of Seena’s biggest charm points is definetely her face, honestly it looks so damn cute. The shiny brown eyes are painted very detailed and the shiny finish really brings them to live, under her eyes Seena has some light blushing marks. Her mouth is very well sculpted and puts a gentle smile onto her face. The detail of sculpting at her upper body looks very good. 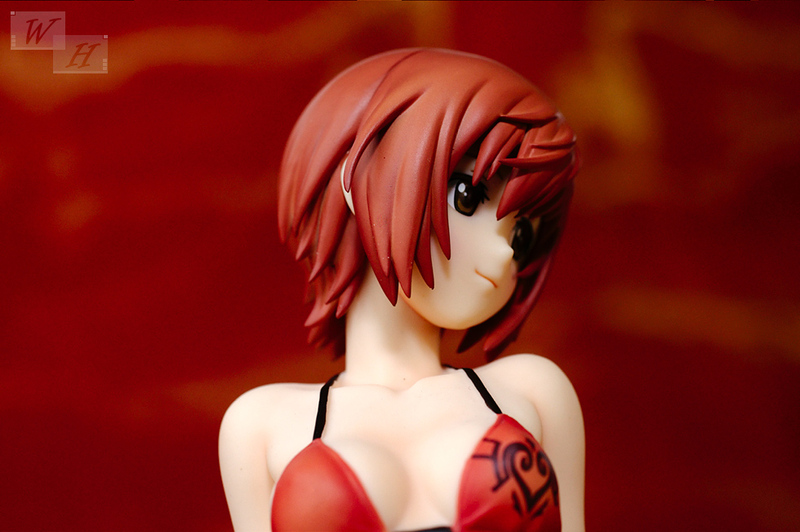 Nice details are the collarbones, the stomach as well as her backside with the area around her scapulas, there is also a subtle shading effect at some parts of her body. The size of her chest fits to Seena’s overall look, not too small and not too big. It is characteristical for characters from Shining Wind is, that they have unrealistic long legs in comparison to their upper body. Seena is no exception here, because of their length, the legs appear a little bit less detailed than the upper body. There isn’t much to say about her outfit, it’s a simple looking orange bikini with black holder strings and ribbons at the backside. A nice detail is the fancy skirt with the square pattern. I tried to cast off the skirt but I didn’t want to rip it apart so I can’t provide pictures of her bikini slip. Nevertheless her paintjob of her clothes looks pretty accurate without showing any noticeable flaws. Afterwards I noticed that the figure can be seperated at the bustline so then you can take off the skirt. Her pose looks simple but nice with the arms entangled behind her back Seena appears very petite which matches the innocent and cute look of her face very well. There could be a tendency of leaning to one side in the future, but so far her pose is pretty stable even though her whole weight only lays one one leg. If you are searching for bikini figure with an innocent, girl next door charisma and an overly cute face, this Shining Wind Seena Swimsuit version would be the right choice. See you next time with Alter’s Momohime review. Seeing your reviews makes me feel glad that I’ve got it too. .-= softz´s last blog ..Universal Studios Singapore – 2010 =-. are you planning to review her,too? 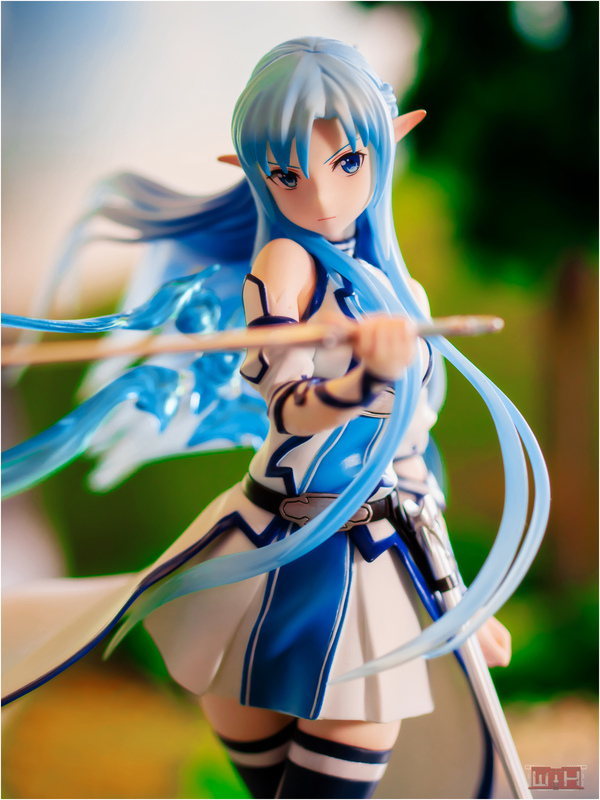 Ah I should of gotten this figure, since it looks really gorgeous. yui need more pretty clothes,eh? yeah her face is so lovely and the hairstyle matches her overall look very well. Oh nice idea for the background. Love the cute face on her ^^. The way the hair flows so naturally looking gives her a peaceful face. Shining Wind characters are all very pretty ^^. I have a couple myself ^^. .-= AS´s last blog ..Addicted to Curry-Manga Review =-. .-= anonymous_object´s last blog ..Yui Meets Moiraine Rin =-. I really like the face expression of this figure, even if I don’t really like the character in Shining anime. 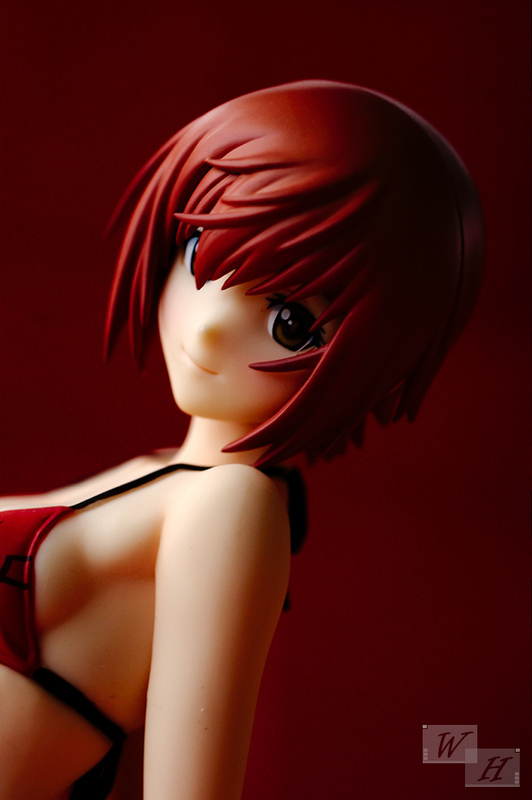 Strange, because this is the only swimsuit Max Factory that I like.